Close your eyes and picture your perfect holiday. Is that the sound of the sea singing in your ears? Or the hum of local life serenading the historic sights before your eyes? You might conjure up images of an enchanting island, where you escape everyday life. Or it might be as simple as the moment you feel year-round sun on your skin? There’s something special about stepping off the plane as it rains back home. And if your imagination’s a little rusty, let us do the work for you! We’re here to give you our take on 2020 holidays, summer excitement, winter escapes – what will it be? Planning your 2020 holiday is a little bit like a confusing Rubik’s Cube – one where we don’t want every colour to match! If the yellow represents the golden sand, you’ll want plenty of these on your side. But you might want to chuck in the fiery reds of culture or greens of rolling rural surroundings. You might twist your holiday puzzle plans into a brilliant border of blue, so maybe an island escape’s just the ticket? With the sea on every side and beaches galore you just can’t go wrong! However you see your 2020 villa holiday unfolding, it’s important that you find a destination that offers just the right amount of everything you crave. We may have grouped our destinations into categories below, but don’t let these snazzy titles fool you – these are destinations where you can pick and mix your dream holiday plan. It might sound like a cliché, but Mallorca really does offer beaches for every taste. Those who love the understated will feel right at home on natural beauties tucked along the coast. Where the landscape and scenery take centre stage! Forget about umbrellas, chairs and entertainment, just set out your towel and enjoy the views. Cala Llombards and Cala Tuent are small beaches framed by pine trees and rocky shores. You’re more likely to find locals here than crowds of tourists, making these idyllic spots perfect for unwinding and some much deserved ‘me time’. Families are all taken care of, with plenty of child friendly stretches! Gently shelving sands and shallow waters are ideal for young kids, while watersports entertain restless teens who love a thrill. Imagine being able to keep the whole family happy on a trip to the beach! No moans and groans, just splashing, laughing and time spent relaxing on the sand. 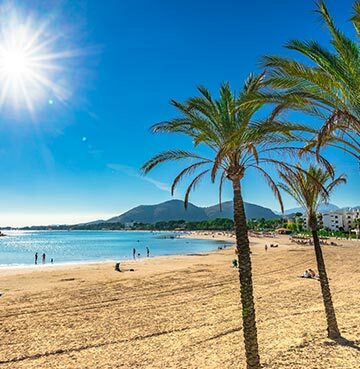 Puerto Pollensa Beach and Playa d’Alcudia tick all these boxes and more. And then there’s the unique beaches that offer one of a kind days by the sea. Sa Calobra sits between two towering cliffs, while the tiny cove of S’illot is protected from strong winds by a giant rock sitting just off shore. A playground and paradise for beach lovers, the Algarve feels like a never-ending supply of golden bays and hidden coves. 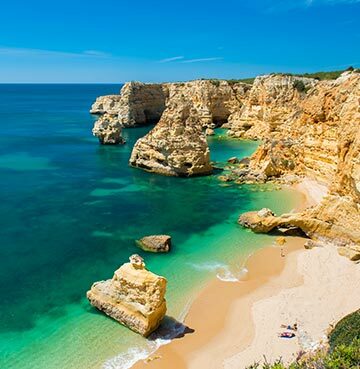 And when it comes to coastal scenery, it doesn’t get much better than the Algarve. This is where towering cliffs come in shades of yellows, reds and all the coastal colours in between. And tucked below these are sands that shimmer in the warm sun, rock formations carved by the crash of the waves and inviting Atlantic waters. You’ll often be treated to a stunning bird’s-eye view of the beach as you arrive at the cliffs that sit above. Praia do Camilo might be the mother of all these, with rocks rising 70m above its sands! More than 200 steps take you down to the beach and the beauty intensifies with each one you take. The craggy coastline also keeps plenty of these beaches off the tourism radar. Where better to unwind than a secluded gem? Praia de Marinha’s thin strip of sand is tucked out of sight behind golden cliffs, so just kick back and admire the stunning curved arches in the rock. Praia de Albandeira is another hidden beach, with the benefit of a wooden bar that sits atop the rocks. Your favourite tipples taste that little sweeter as you drink in these magical views. The Greek Islands are known all over the world. Some are fascinated by the culture, myth and legend attached to these shores, while others are left salivating at the thought of the delightful dishes found on restaurant tables here. But for so many it’s the island beaches that shine brighter than any meal or monument. And Crete is home to one of the Greek islands’ most magical coastlines! Blessed with some truly unique beaches and remarkable delights by the sea, where better for your 2020 beach holiday? 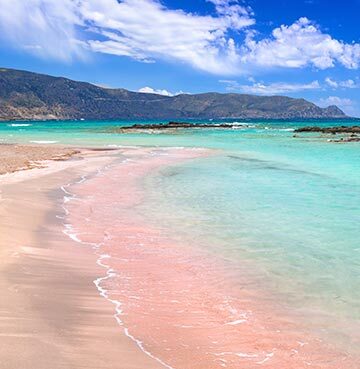 The pink sands of Elafonissi are a must-see for beach lovers, with crushed shells adding this wonderful shade to the stretches of white sand. The turquoise lagoon here is the most brilliant shade of blue, creating a beach rainbow of colours for your enjoyment. Make sure you’ve packed your sunglasses! Shallow enough for your little ones to enjoy, it also lets you paddle out to the nearby island. Balos beach and its lagoon are lesser known, but they’re equally beautiful! Plus, you’ll find more of that stunning pink tinged sand here, so maybe you’ll choose to visit both? Preveli Beach is a little out of the way, but that’s all part of the charm. A 20 minute walk from nearby parking spots is made worthwhile by the amazing sight that awaits. Palm trees line the river that passes through this sandy beach on its way to sea! With an exotic and secluded feel, this is a truly jaw-dropping beach. The weather’s warm, the people are warmer – the Caribbean is an exotic escape all year long! Although the white sands and tropical palms might shine that little bit brighter when it’s cold and gloomy back home. A treat for every sense truly awaits, when you step foot on one of our Caribbean islands. Temperatures sit in the mid to high 20s year-round, ideal for a 2020 holiday whenever you’re planning an adventure. A balmy treat for your skin and music to the ears of sunseekers and beach bathers! Every island has its own story to tell, with fascinating pasts and intriguing cultures. Historic monuments often show signs of the empires that once conquered these islands and you might hear a variety of languages as locals chatter. Although you might taste cultural influences before you see or hear them. Caribbean cuisine blends local recipes with African and European culinary twists, creating mouthwatering treats whenever you reach for a menu. Wash it down with a glass of local rum and you’ll soon be feeling as friendly and laid-back as those welcoming locals. 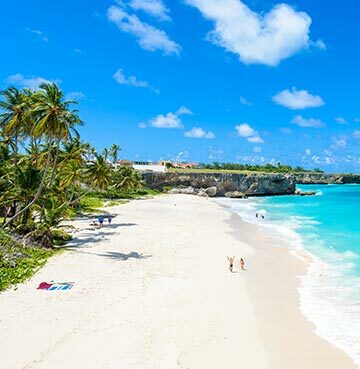 Antigua is home to a whopping 365 beaches, spoiling those of you in search of soft sands. But when you head inland, amazing sights, rainforests and so much more await. The towering Piton peaks dominate St. Lucia’s landscape, with its ‘drive in’ volcano another highlight for plenty of visitors. Culture and history galore are waiting on Bajan shores, coupled with some amazing natural beauty. Exotic flora, rocky caves and stunning beaches – take your pick. Meanwhile on Jamaica, mountains, rainforests and lagoons meet a choice of spectacular golf courses. The beauty of a villa holiday is that you’ve got the freedom to explore at your own pace, picking out the sights that are simply must-see in your eyes. You don’t have to go long haul for year-round sun, 12 months of glorious sunshine are waiting closer to home. Average monthly temperatures hover above 20°C on the Canary Islands, creeping closer to 30°C in the summer months. Perfect for your dose of winter sun, your summer escape or whichever month takes your fancy. And it’s just as well, as the beaches here are a sight for sore eyes and a treat for cold feet! From dark volcanic stretches to nature reserves packed with golden sands, these islands are a beach lovers’ dream. Adrenaline junkies will feel right at home too, as favourable wind conditions make the Canary Islands a watersport haven. Natural beauty awaits on each Canary island and with such wonderful weather, you’ll love ticking these off your to do list! 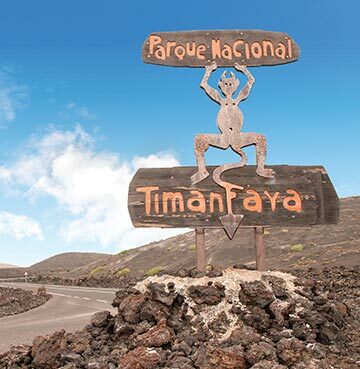 Lanzarote’s out of this world volcanic landscape is captured perfectly in Timanfaya National Park. Paths wind their way around deep craters and mountainous peaks here, a science and geography lesson brought to life as you hike around. Tenerife’s Mount Teide is another towering sight, but you’ll also find tropical forests and lava tunnels on these shores. Gran Canaria’s Roque Nublo rises to a staggering 80m and climbing to the top of this lava plug offers breathtaking views. Lush green valleys can be found inland on Fuerteventura, while Corralejo’s amazing sand dunes are like a stretch of Canary Island desert ready to be explored. The hard decision is picking the island that you love most! Think of Tuscany and it’s the crisp whites and fruity reds that instantly spring to mind. But before your taste buds start tingling, these rolling hills grow a lot more than just flavoursome grapes! Olive oils, meats, cheeses and beans and so much more are produced by Tuscan farmers. And it’s not long before these local ingredients head to restaurant kitchens and the plates of tourists looking for a tasty treat. Its stunning landscape has also been the inspiration for generations of artists, including some of Italy’s finest. Artistic flair, masterpiece paintings and infamous sculptures can all be found in some of Tuscany’s famous cities. Our villas put two of the most famous and magical in touch - Florence and Pisa await less than an hour away. A 2020 villa holiday here is the splash of culture you’re craving and so much more! 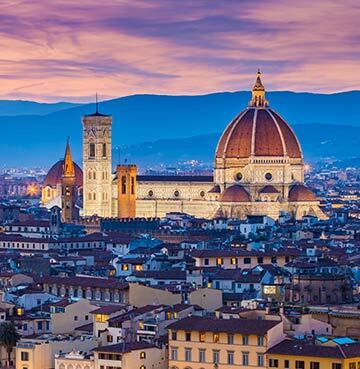 Florence is a work of art in itself and any chance to head for a rooftop bar should be snapped up without hesitation. With a skyline to die for, heading to higher ground paints Florence in a perfect light. The River Arno carves through the labyrinth of piazzas and traditional buildings, with cathedral domes and towering monuments immediately catching your eye. Michelangelo’s David, the Uffizi’s collection of Renaissance art and so much more await for art lovers. Although sometimes it’s the subtle touches of creative flair that are most enjoyable! Florence is the perfect city for walking around, getting lost and finding all those little details that decorate doorways or caress the edges of buildings. Selling Pisa is a piece of cake! You’re well aware of the leaning tower, but what else does this city have to lean on? There’s plenty here for you to enjoy! Pisa is home to a stunning cathedral that’s equally beautiful inside and out. Lay back on the grass of its piazza and admire its impressive dome and marble arches. Head inside for lavish gold decoration and a fresco that decorates the ceiling above. The River Arno also runs through Pisa, with amazing sights sitting on its banks. The 13th century Santa Maria dell Spina church is a gothic masterpiece, made more impressive by its small scale. While the Palazzo Blu is home to Pisan art dating back to the 14th century, the building here is just as old but has been lovingly restored. And, you guessed it, its striking façade is painted in a wonderful shade of blue – a colourful complement to the river below. Just an hour from Lisbon, our Silver Coast villas put the Portuguese capital in touching distance. Effortlessly cool and with a real buzz about it, Lisbon’s like a Hollywood actor with a glint in his eye. Once it flashes you a smile, you’ve fallen for its charm. Maybe it’s the cobbled streets, the ancient trams or the funicular railway but there’s an authentic and traditional feel here. The city comes alive at night, with Barrio Alto’s bars at the heart of this – ideal whether you fancy a quiet tipple or a lively evening. And if you’re a history lover, you can fill your boots with a visit to Lisbon! The 500 year old Jerónimos Monastery is a beacon of Portuguese Gothic architecture, while the 16th Century Torre de Belem is still standing strong today. Built to protect Lisbon from sea attacks, its current condition is a testament to those who designed and crafted it. 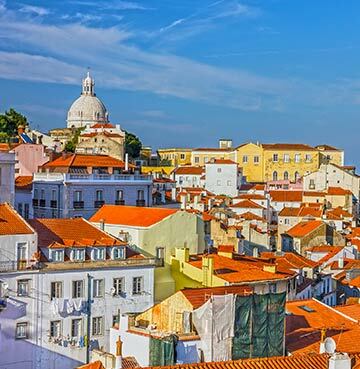 The Silver Coast has plenty to shout about too, so you might never make that day trip to Lisbon. Untouched and undisturbed beaches have a white and silvery tinge, with amazing conditions for watersports. Foz de Lizandro hosts two international surf competitions, so there’s nowhere better to jump on your board. Obidos is as picturesque as Portuguese towns come, with its medieval heart tucked away behind ancient walls. Its cobbled streets take you on a tour of whitewashed houses, decorated with splashes of colour and vibrant flowers. Peniche has a walled centre of its own, but you might find what lies beyond more interesting. This harbour town has plenty of fishing heritage and stunning beaches scattered along the coastline. It’s also your boarding point for the ferries to the Berlenga Islands, a nature reserve that’s home to seabirds and plenty more of those pristine sands. Hollywood may have shone a light on its brilliance well over a decade ago, but Kefalonia clearly hasn’t read the script. Normally a wave of tourism would wash over such an island, taking the shine off its heritage and tradition. 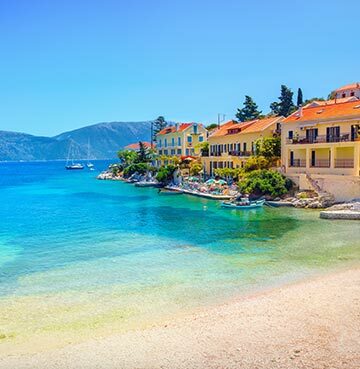 Kefalonia has resisted and that’s what makes this Ionian island ever so appealing! Those A-list beaches are still beacons of sandy charm, the fishing villages seem even more characterful and the natural beauties remain just as nature intended. This is island escapism at its very best. Myrtos Beach was one of Captain Corelli’s Mandolin sandy stars and if there was an award category for ‘Best Leading Beach’ it would be a shoe-in! The curving bay is bordered by towering cliffs that somehow give the turquoise waves an even more electric shade. Be sure to take Myrtos in from above before you head down to the sand. Antisamos largely goes under the radar, but this long pebbly stretch is a beautiful beach in its own right. Swimming and snorkelling in its crystal clear waters is a real treat for beach lovers who enjoy a dip. Fishing village charm oozes from Fiskardo, where boats are still found bobbing along by the harbour. Although there’s plenty more treat for the eyes here! Traditional buildings line the waterfront, with plenty of pastel colours and hints of Venetian architecture. Your best bet is to grab a seat at a bar or restaurant and simply drink it all in. If it’s the sound of those bobbing vessels that floats your boat, grab a slice of natural beauty with a row around the Melisanni Cave. The underground lake is a spectacular sight, surrounded by trees and illuminated by an opening in the roof. An island for every taste! History lovers, hikers, beach goers and foodies will feel equally at home on Sicilian shores. When you look at every empire that’s claimed a little piece of the island, it’s like a who’s who of conquerors, rulers and fascinating cultures. Greeks, Romans, Normans, Arabs and the Byzantine – they all came for a slice of Sicily. You’ll spot their mark all across the island and sometimes their architectural eyes even complement one another. Palermo Cathedral is a blend of Arab and Norman architecture, its dome and intricate decoration a sight to behold. 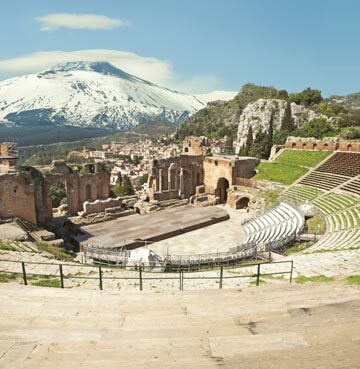 Taormina’s Greek theatre was actually rebuilt by the Romans and its seats come with the added bonus of Ionian views and the sight of Mount Etna. Create your chapter of history with a 2020 on Sicilian shores. The empires may have come and gone, but Europe’s tallest active volcano has been a mainstay of the island’s beauty. Where better to wear in your hiking boots? Tucking into the catch of the day at a beachside restaurant is a culinary delight, with fish so fresh its flavour explodes in your mouth. Sicily has a mouthwatering menu, borrowing ingredients and dishes from past invaders and nearby neighbours. Although plenty of flavour comes from locally grown fruits and vegetables. Its enviable position offers ideal agricultural conditions, so you can expect flavoursome dishes with a signature Sicilian taste. Both red and green grapes thrive on the island, music to the ears of wine fanatics! There’s plenty of local tipples to sample here and as those flavours dance across your tongue, you’ll soon be raising a glass to Sicily. Small and mighty, Malta is an island escape with plenty to do! We’re only scratching the Maltese surface here, but you might already be puzzled at how so much history, beauty and hidden surprises fit onto this island. The coast feels like one of those vibrant layered cocktails, with wonderful shades sitting atop each other. Azure seas caress the golden sands, sitting beneath the rocky cliffs – so expect to stumble upon hidden bays and secret caves among all the colour. The Blue Grotto is the pick of the bunch and the most colourful of them all! The waters here reach new levels of luminescent blue, sparkling away beneath the limestone arch. Malta’s fascinating tale is told by monuments and cities dotted all around the island! Your holiday hire car comes into its own here, so buckle up for a whistlestop tour of times gone by. The Maltese even drive on the left, so you’ll feel right at home on the roads. Although with the renowned hospitality of these smiley islanders, you’ll feel welcome everywhere you go. Megalithic temples date back thousands of years and these unique stone structures are a striking sight. 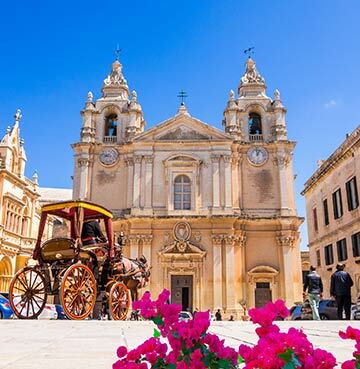 With prehistoric Malta ticked off your list, your next stop is the original capital. Time has stood still within the walled city of Mdina, where historic buildings line narrow streets. Known as the Noble City for its aristocratic past and the Silent City due to its lack of cars, whatever you choose to call it you can expect to be charmed. The current capital of Valletta brings you up to speed with the most recent chapter in the island’s story. Since 1565 it has been at the heart of Maltese life and is home to a 16th century cathedral, National War Museum and impressive defensive fortifications. Just like its sister island, Gozo is also jam packed with plenty to do. The beaches here are just as beautiful as those on Malta, so you can expect more of those brilliant blues. The Ġgantija Temples are a testament to Neolithic architecture, harbour towns offer plenty of fishing heritage and the city of Victoria is a maze of winding streets. Where better to get lost and grab a good look at Gozo?